So, what is the club’s current battle disposition? From Trapp in net, through Thiago Silva and Dani Alves in defense, to Krychowiak, Pastore and Di Maria in midfield, the team is serving the ball to two superb strikers – Neymar and Cavani. And they are doing all that in their new Nike battle armour and looking awesome! Let’s then review the PSG kit, shall we? The official PSG home shirt is – as always – dark blue. That’s not likely to change in the next century or so and we are fine with that. The sleeves are now dark red which goes all the way up the shoulders to the collar that has the French tricolor flag on it with the words “Paris” at the back. The writing is most likely to ensure that should any of the players ever get lost, they will be returned to the French capital, but it has the added bonus of looking quite professional. The red motif is also present in the iconic PSG stripe that runs from the collar to the seam in the middle of the chest. This year, the stripe is thinner and doesn’t have white borders. It is made of small chevrons stacked upon one another. Finally, the large, white letters of the club’s sponsor as well as the Nike hash and club crest round off the design. The football apparel manufacturers are constantly seeking new high-tech innovations to add to their garments and one day the football shirts will most undoubtedly wash themselves and provide internal heating. For now, however, they already feature some amazing technologies and Nike has been a pioneer in this regard. You see, as part of the company’s “sustainable innovation” project, they constructed the PSG shirts from recycled plastic. The resulting microfiber is actually made of melted down used plastic bottles. This makes the shirt completely 100% polyester, but it gives it a surprising comfort and an elegant fit. This is mostly due to the AeroSwift technology used in the fiber’s construction, which makes the garment approximately 10% lighter but also 50% more stretchable. Additionally, the jerseys also come with Dri-FIT, which is another Nike proprietary technology that works in an even more amazing way. Simply put, the Dri-FIT construction allows the fabric to channel the sweat away from the skin and to the surface of the shirt, where it evaporates faster. The result is a more dry and more comfortable experience for an athlete. Finally, the Nike Vapor Match shirts – which are the uniforms worn by the PSG players – are constructed in the “superhero” fit. They are tight fitting and accentuate the musculature of each player… no doubt to the delight of the female fans. If you are a Paris football fan and still don’t have one of the PSG current season shirts, what are you waiting for? The club doesn’t support itself! If you are not a fan, then you must admit that now may be the time to sign up. With a star-studded line-up featuring Neymar and Cavani up front and the team looking awesome in their 2017-18 apparel, it’s hard not to get excited for the Paris giants, if only for one season. The team’s away shirt – the bright yellow one – may make it somewhat difficult to run away unseen from authorities or blend into the walls at parties, but it does have an important meaning. Paris have a standing tradition of seeking out talented Brazilian players for their lineups and the yellow away jersey (which matches the Brazilian national kit in colour) is their way to promote that ideal. This year, following to their historic signings of Ronaldinho, Maxwell, Thiago Silva, Marquinhos, Rai and Lucas Moura they acquired Neymar Jr for their starting eleven, increasing the team’s domestic and international potential with another member of the Seleção. No club would ever be complete without their third apparel. For PSG, their colour of choice is black. The outfit is entirely monochrome, with the exception of all the embellishments (shoulder stripe, club crest, sponsor and the Nike logo). That’s quite a departure from last season’s all white third kit. We’d like to think this is due to PSG’s shift to the dark side of the Force, but the real reason is probably much more mundane. Regardless, the closer inspection of the shirt will reveal that the fabric hides a camouflage pattern in its dark finish, the words “PARIS” are written across the lower back and the club’s crest and the shoulder stripes are actually metallic silver, instead of white. The design is reputed to take inspiration from the Eiffel Tower, although one may need a drink or two before such a resemblance becomes apparent. Still, the black version of PSG shirt is a definite hit and it does well as streetwear. It will undoubtedly intimidate quite a few opponents this season. Important to Know for Each Paris Football Fan! 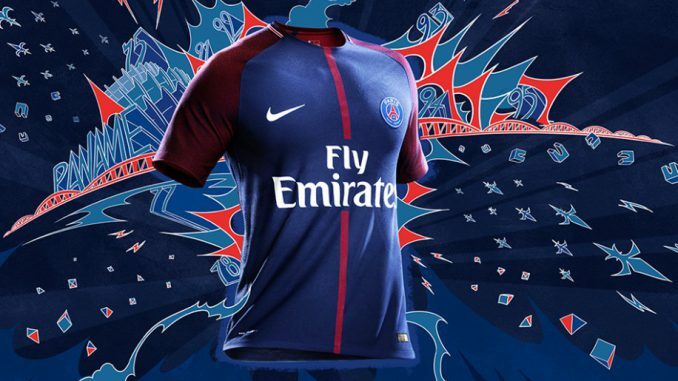 For a Paris football fan interested in showing his or her allegiance to the club it must be noted that the official PSG shirt comes in two varieties – Nike Vapor Match and Nike Vapor Stadium, both available to fans. For an in-depth comparison of the two styles you can check here, but basically the Match variant is exactly what the PSG players wear on the pitch. It’s tight fitting, so if your body doesn’t resemble a 20-something year old professional athlete, it may look a bit off, but it does provide the closest experience to the real thing. The alternative is the Stadium shirt variant, that is very similar to the Match one with just some small alterations around the collar and the sleeves. It doesn’t feature the AeroSwift technology, but it does come with Dri-FIT. Most importantly, however, it is looser fitting and a bit more forgiving to those who are more accustomed to watching football rather than playing it. It is also easier on the wallet. The best place to get the official home or away PSG shirt is from Subside Sports. The site provides all the sizes and deals only in official club products. How do you rate PSG chances this year? The team surely feels impressive – at least on paper – and it certainly looks the part. Do you think this may be the year of Paris Saint-Germain in the Champions League? I like the away shirt and after my brother’s favorite player is now a Paris Saint Gearmain player, I will get it for him as a present. My bro plays football a lot do you think can it last a year? With Neymar and now Mbappé on a loan from Monaco, they look the part. This new team is quite impressive and quite desperate to finally win the Champions League. Dani Alves is a great addition to the defense as well. It’s definitely the time to get excited about PSG this season! I’ll be watching closely. They do have an impressive line up this season. I think they will go all the way. How many times have won a major title? 3 or 4 times? This indeed may be the year! PSG won the French league 6 times and Europa League once (although it was the UEFA Cup Winners’ Cup back then). After last year’s epic fall to Barcelona, they are definitely looking at the Champions League final this year. Really cool information. Really like the details that you provide on the features and technology behind the apparel. Apparel made from recycled plastic, didn’t know that was possible. By the way, I like watching football. Thanks for the post. nice review. these are some good looking jerseys. i like the fact that Nike is using recycled goods to produce quality gear, well done Nike! Indeed. Nike has been committed to innovation for quite some time now. They are not the only company who are doing it, but they may just be the leader in garment technology these days. Thanks for the comment! I love the away shirt! I’m definitely biased when it comes to the Nike brand. I love that they are getting into creating new gear by recycling! That’s so great, I didn’t know that. Thanks so much for sharing! The away shirt is awesome! My father and I are big football fans and I am sure that he would love this shirt for his birthday! Thank you so much for writing this review! You helped me find the perfect gift! Something about yellow that really stands out, isn’t it? Happy birthday to your father! Wow, those are such cool looking shirts! I am also very impressed to know that they are made from recycled material. Very good and detailed review! I wonder whether they ship worldwide. They sure do. If you follow the link in the “where to get it” section, it’ll take you to a page where the shirt can be shipped anywhere in the world. Definitely looks very stylish. All of the kits are very cool.